Looking back, it’s hard to believe that when we first set off with our bags strapped to our backs to travel the world that the Philippines wasn’t a place we ever really intended to visit. We flew in on a gamble, thinking we’d spend three weeks and wound up tumbling so head over heels in love with the country that even after nearly two months spent idly drifting from island to island (seeing but a scant fraction of all there is to discover) it was hard to tear ourselves away. While we were there, an amazing tourism campaign called “It’s More Fun in the Philippines” was being run domestically. You know what? They’re right. It IS more fun in the Philippines. Hardly a day went by where huge, gleaming grins didn’t grace our faces, mirroring the looks of elation and contentment that were present everywhere we looked. Maybe it was the gorgeous beaches and lush islands, the mesmerizing dive sites, the low cost of living, or the incredible kindness and warmth of the locals… for every island in the Philippines (and there are a lot) I could probably give you a reason to fall in love with the place. Whatever the case, the Philippines wriggled itself deep under our skin and caught us good. Visit the Philippines and you’ll realize that far fewer people visit here than such an awesome destination truly warrants. Perhaps people are dissuaded by the fact that travel here more often involves ferries and flights than it does tuktuks or night buses, while lingering memories of headlines sensationalizing violence or kidnappings keep others at bay. These are baseless excuses. The Philippines is perfect for those with a true sense of adventure who like to believe that there still exist places on this planet that are simply waiting to be discovered. As for danger, the vast majority of the Philippines is incredibly safe and within a few days, you’ll swiftly realize that the only danger you’re in here is that of irrevocably losing your heart. Seen most places: “Taglish,” a mixture of English and Tagalog, which sometimes made signage very confusing (though not in this case, thank goodness). The official language of the Philippines is Tagalog (also simply known as “Filipino”), which is likely one of the easier languages you’ll encounter when traveling through Asia. Of course, being an island nation, most locals will generally speak a local dialect in addition to the national language. For instance, in Dumaguete, people will likely chatter away in Cebuano, whereas just a short ferry ride away, the people of Bohol will speak an even more regionally specific variant of this, Boholano! Given that one of the biggest allures to the Philippines is the ability to island hop with abandon yet the country has 171 native languages currently spoken, what is an intrepid-yet-linguistically-sensitive traveler to do? Well, a few words of Tagalog certainly won’t go amiss or unappreciated, but for most of us, we’re in luck: English is actually an official language as well! Consequently, critical English signage was prevalent (though, amusingly, most billboard ads tended to be a hodgepodge of English & Tagalog that were only moderately comprehensible to us) and we can’t think of a single person we met who couldn’t speak English with some degree of competence; in fact, most locals were startlingly fluent. In so many ways the Philippines feels nothing like Asia, and surely the prevalence of English has something to do with that. 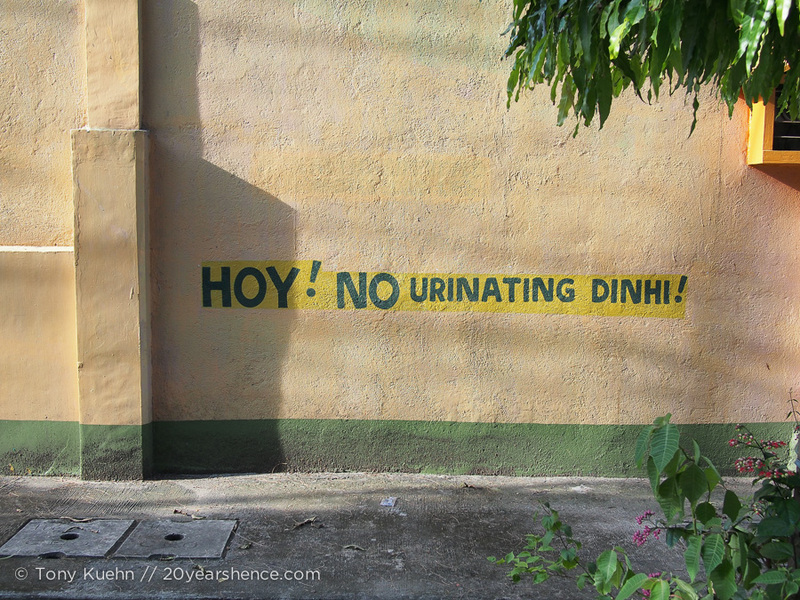 Whatever fears may be holding you back from visiting the Philippines, don’t let worries about a language barrier be one of them! 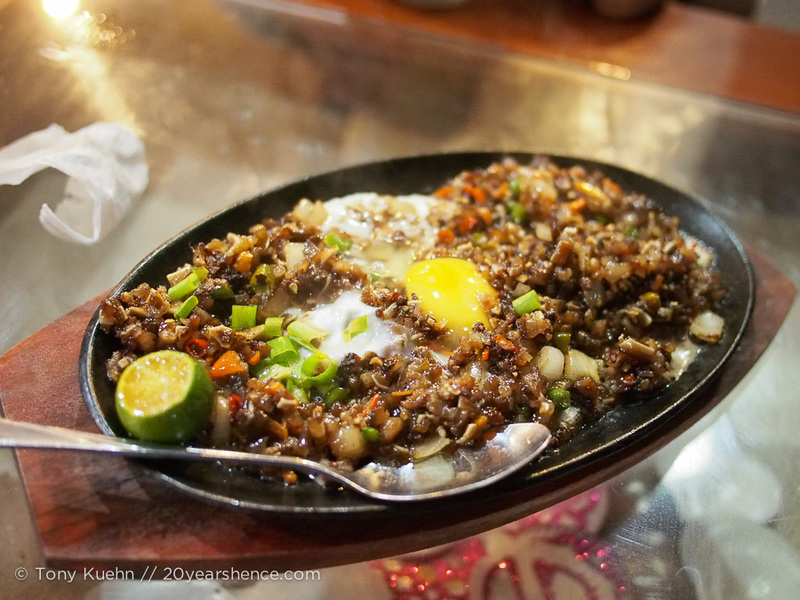 The most inedible food we encountered during our stay: sisig. Though, this particular dish failed mostly due to the vast quantities of bird’s-eye chillies mixed in with the gristley meat, making this by far the spiciest dish we have ever set lips on. We didn’t know much about the food coming into the Philippines save for a few rumblings of a less than palatable culinary scene from a few fellow travelers. As self-proclaimed local-food lovers, we were determined to prove the naysayers wrong. By & large, we were really underwhelmed with the food options available to us in the Philippines. We ate A LOT of grilled/barbecued meat (generally chicken or pork) with plain white rice and, if we were lucky, some pickled papaya salad. In part this was because whenever we asked locals what we should definitely try, this is what they told us they loved. The other reason is simply that most dining establishments just didn’t offer much variety and this meal was by far the most prevalent. The only other indigenous dish we ever saw with routine regularity (and is therefore the second-most frequent dish we consumed) was chicken adobo, a stirfried chicken dish with a vinegar-based marinade. Apart from these two dishes, most restaurants serve up greasier & sweeter versions of Western foods: pizza, hamburgers, spaghetti, & fried chicken can all be found in abundance. But unless you’re out to contract diabetes, you’ll probably stick with our diet of meat & rice. Seriously, if you think we’re exaggerating when we say that Filipinos love sugar, read this post in which a successful attempt at making local pork sausage, chorizo, required 2.5 cups of 50% fat ground meat and 1/4 cup of sugar!!! If you’re jonesing for junk food, well, the Philippines might be your food paradise, but for us, the food was truly the sole element of the country that was hard to stomach. From heavenly beach-side bungalows to seedy brothels masquerading as hotels, the Philippines has something for every traveler at every price point. 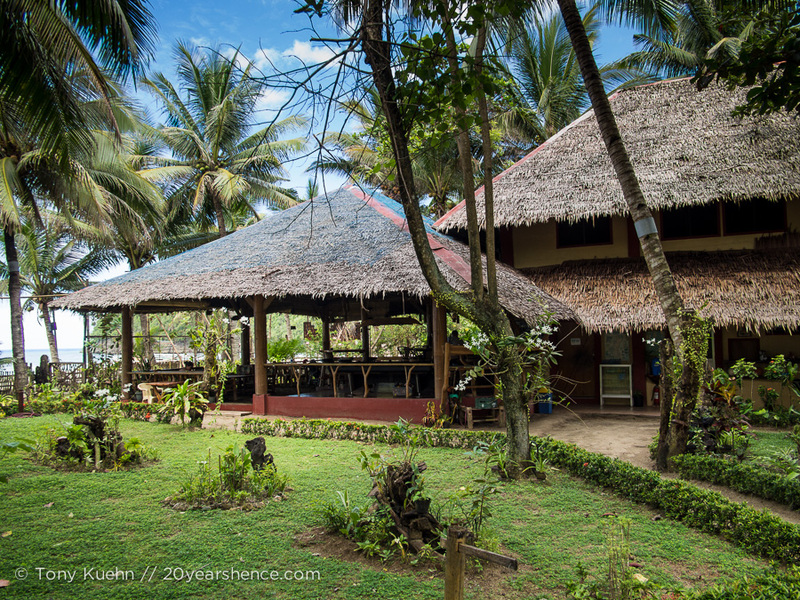 Although not every place we stayed was brimming with character or charm, with the exception of one night, we found Filipino lodging to be fairly clean and comfortable, though often very basic. One nice thing is that unlike other parts of Asia, Filipinos understand the virtue of a soft bed, so although you might wind up in a room with a bucket flush toilet, you should still manage a good night’s sleep… at least until the roosters start crowing! One thing for budget-minded travelers to note is that one ramification of the Philippines not really having an established backpacking circuit is that, save for two or three of the major cities, you won’t really be able to turn to hostels or dorms to cut down on your lodging costs. Thankfully, the dearth of hostels doesn’t mean there aren’t any budget lodgings on offer: instead you can look forward to bunking down in guesthouses or transient houses. We know, “transient house” isn’t the most appealing of names and has unfortunate connotations to most native English-speakers, but in the Philippines, there’s nothing disreputable or shady about these places. For the most penny-pinching of travelers you might find discounted rooms that have a shared bathroom, but generally speaking you can find private ensuite rooms fairly cheaply. If you want to splurge, well, that’s easy to do as well as nearly every city will have at least one or two luxury options for those with more to spend. Another thing we found is that especially when traveling during shoulder (& low) season, it pays to simply show up and pick a place rather than booking in advance. This is because there is always far more lodging available than even the best internet search will ever reveal, and the places that are the cheapest tend not to have a website or any internet presence at all. Also, it is completely acceptable to haggle over accommodation prices, especially if you are staying multiple nights, and this is obviously much easier to negotiate in person. Finally, as lodging quality varies dramatically even within cities, we found we preferred being able to see our room before we made a financial commitment to it. Also, price is no guarantee that you’re getting a nice room, as we stayed in a private bungalow right off the beach for $20/night that was quite lovely, but the same money in Manila had us pulling out our sleep sheets for the very first time on our journey. The only way to be confident you’ll like where you’re staying is to handpick it. Finally, when you’re doing the rounds looking for a room, even after you’ve been quoted the cheapest price a place has, it is ALWAYS worth asking whether there are any fan rooms or will offer a discount if you don’t use air conditioning. Even nice resorts often have a few fan rooms that they won’t tell you about right off the bat unless you specifically ask for them and these can often be cheaper than their “cheapest” rooms. We never paid extra for A/C while in the Philippines, generally because in most places the electricity is not reliable enough to make it a worthwhile splurge. Same goes for hot water: you’ll often pay less for rooms that only have cold water showers, which may sound unappealing but we were frequently so hot that we rarely took showers that were any hotter than tepid even when given the chance. There’s no two ways about it: traveling from place to place eats up a lot of time in the Philippines. It never seemed to matter how far we were going or what manner of conveyance we used, whether we went over land, sea, or air, it always seemed at least 6 hours were lost to travel. That said, although the routes are not always obvious and you’ll pretty much never see an official schedule, because English is spoken widely enough, you should never really have any trouble figuring out how to get where you need to go. If you are planning to travel within an island, you’ll likely be relying on buses or shared vans; the latter is more common in Palawan and costs more than a bus but has the potential to be more comfortable and quicker. On other islands, we relied more on buses which are generally very cheap, though they will vary in quality. We rarely got to choose whether we were taking a bare-bones chicken bus or a fancy VIP bus with air con & WiFi, but more often than not, expect something less than luxurious. You buy your ticket on the bus—just tell the ticket seller where you are headed and they’ll tell you the right price, which scales with the distance you are traveling. It is important that you keep your ticket on you as periodically you may be asked to show it (even if it’s the person who sold it to you doing the asking…). Unless your destination is the end of the line, repeatedly ask the ticket seller whether you have reached your destination, because half the time the stops are not marked and you are dumped at the side of the road and only locals seem to know where they are. There is no need to pack lunches or worry about food during these long journeys as plenty of pit stops will be taken and snack vendors frequently pile onto the bus to peddle their wares. Between islands, you have the choice of taking ferries or flying. The ferries are generally pretty comfortable with assigned seating and movie screenings (we watched a pirated version of The Avengers on one, which was great!). It’s unlikely you’ll be on a ferry long enough for it to become an issue, but we did not notice any kind of food when on board, so if you’re traveling during a meal time, make sure you bring food with you. Also, although there were many signs in the ferry terminals talking about baggage fees and weights, our packs were never weighed and we never had to pay extra for them, but if you have very large bags, you may need to pay a bit more. It’s also worth noting that ferries can actually be quite expensive—forget about paying $5 or $10 as you will more likely pay upwards of $20. We wound up flying quite a bit in the Philippines as this is almost always faster than taking a ferry (even taking into account time spent waiting at the airport) and generally was not very expensive given the time savings. The two major budget airlines you should consider are Cebu Pacific and Air Phil Express. We actually flew exclusively with Air Phil Express, and due to some amazing sales, often did so for $50 total per flight for the two of us. Although Cebu has its proponents, we have heard they can be quite cutthroat about canceling flights last minute and bumping people who have not arrived for check-in well before the cut-off. We have nothing but good things to say about Air Phil Express as not only do you get 10kg of free checked luggage (practically unheard of with any other budget airline), but you also get free snacks & drinks during the flight AND every single flight that we took with them landed early… sometimes to the tune of 40 or 50 minutes! When was the last time that ever happened? Bottom line: ferries can be pricey, but if you plan in advance, you can fly for next to nothing! When it comes to traveling within cities, some of the larger cities will have taxis, but you’ll more likely wind up taking a trike instead. 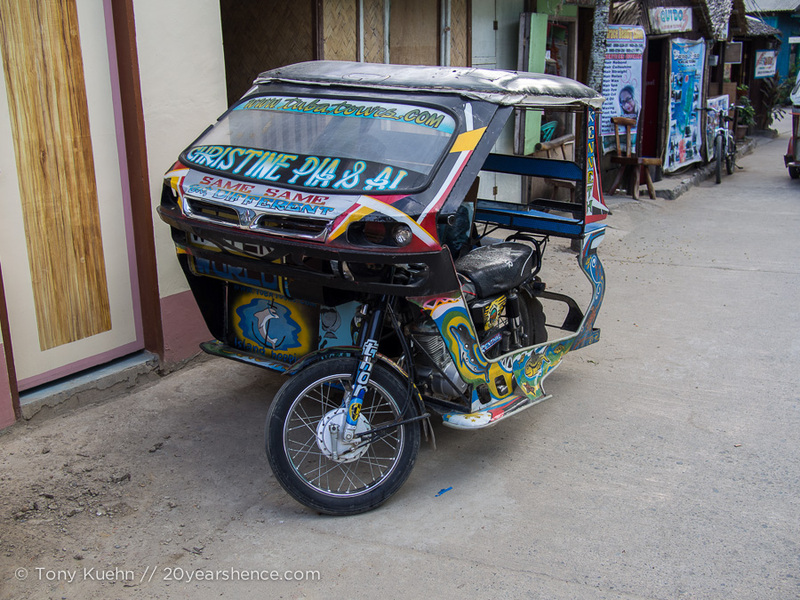 These are essentially the Filipino version of a tuktuk, a motorcycle hooked up to a covered side car. Often drivers will charge per person (always clarify this point when discussing prices with them!) and will charge extra if you have bags, but a ride in town should never be more than $2. Definitely feel free to haggle, though you only need to do so aggressively if you are at a ferry terminal or bus stop. Occasionally you may find yourself in a shared trike, but that is less common. For slightly longer distances, look for brightly colored trucks called jeepneys. These supposedly have fixed routes that they run, but we could never figure out what they were, though most jeepneys have their end destination listed as well as some major stops along the route. However, it’s best to simply ask locals or your guesthouse where to catch the jeepney you want in order to get where you’re going. These are essentially the equivalent to a city bus (the buses you are used to generally only run long distances in the Philippines), and you’ll be crammed in the back with as many locals as they can fit. Once again, there are no fixed or marked stops: to signal that you’d like to alight, simply bang on the roof (most people use a coin) and the driver will pull over. You pay when you get off, and more often than not you will pay a flat rate (which you can ask in advance). 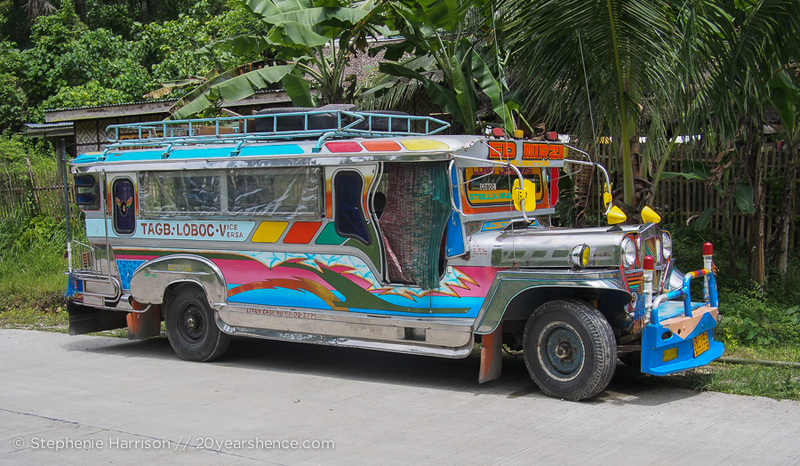 Jeepneys are very cheap—generally no more than 50 cents per person. For those with a truly independent spirit, the best way to witness the Filipino scenery is by motorbike. In most cases the roads are quite good and traffic is minimal (though the latter is only true if you’re in smaller cities or off-the-beaten-path islands). You can always negotiate a better rate on a bike if you take it for multiple days; it is often worth doing this because without fail you will be provided a bike that has no gas in it, so this is an additional cost you will need to cover. Just be sure to take this into account when haggling over prices. Unless you take your bike for an extremely long time, you will likely wind up paying at least $6/day for a bike. In case we haven’t made it abundantly clear, the Philippines are really cheap. You can live like a king for very little, though any activity or transportation option involving water will likely be pricier than you are expecting. 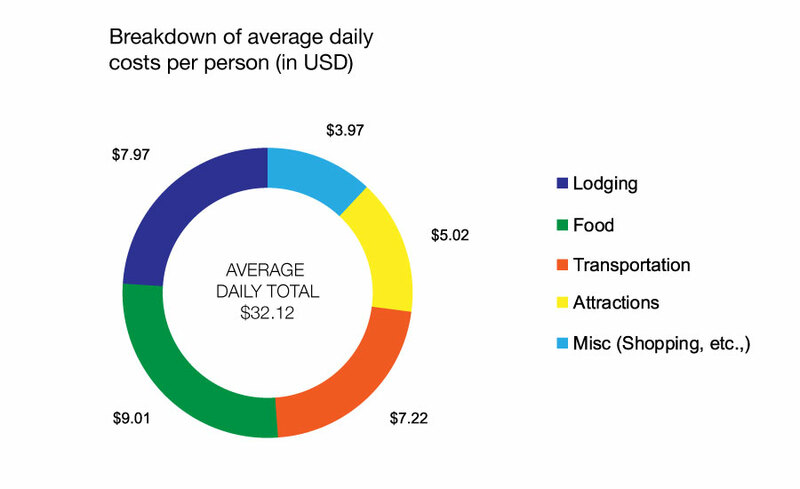 One other area that most people agree seems to be disproportionately expensive is lodging, especially when compared (as it so often is) to Thailand. Note that, however, even if lodging prices are slightly high, food and local transport costs generally balance that out. Many attractions or sights will have a small admission fee, but these also tend to be very low. 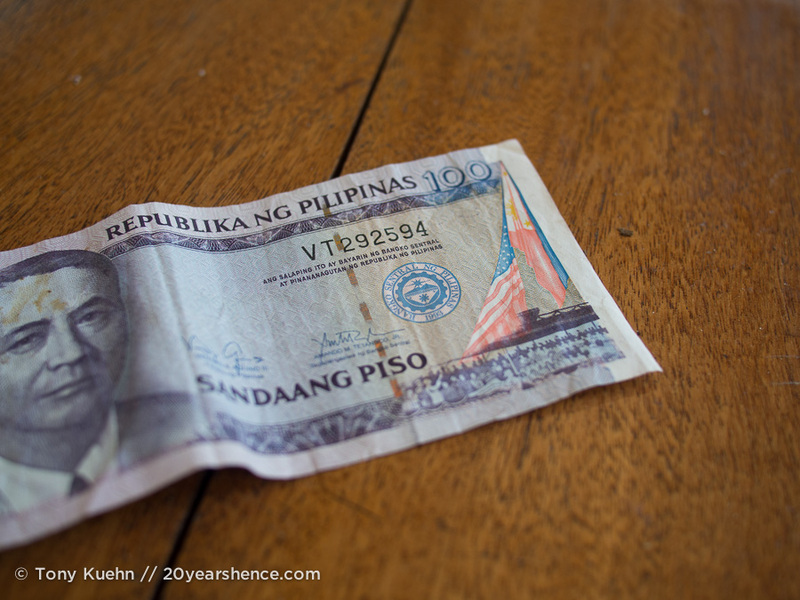 If you are planning to get off the beaten track or visit smaller cities/villages, it is probably worth it to stock up on local currency (the Philippine Peso) as we did visit several places that did not have any ATMs. For example, the only city on the entire island of Palawan that has ATMs of any description is Puerto Princesa. You can probably find money changers if you are carrying U.S. currency, but don’t count on it and instead plan ahead. We rarely were able to use our credit card in the Philippines and in the rare instances where it was a possibility, most establishments tacked on a hefty transaction fee, sometimes as high as 6%. Clearly you are better off paying in cash! To the best of our knowledge, the Philippines does not enforce any kind of firewall, but this may simply be because internet connectivity is dreadful in large parts of the country. Many places simply did not have WiFi or, if they did, it was so slow as to be practically useless. Other places did have internet access, but regular power disruptions meant that there were long periods during the day when we were yet again without internet. Essentially, the Philippines is not the place for digital nomads. We did pick up a SIM card for our phone while we were in the Philippines, which actually proved to be quite useful and reasonably priced. We went with Smart because they have some of the best coverage throughout the country. We paid about $5 for the card which came with a bunch of minutes and texts; for a small fee (<$1) we were able to pay for unlimited 3G access for 24 hours which we indulged in once or twice when the internet situation became truly dire. The greatest benefit for us was being able to contact guesthouses in some of our more remote destinations in order to set up reservations as well as pick-ups; as most of these places didn’t have internet access, texting or calling them was the only way to get in touch! Projected Daily Budget, per person: We didn’t have one specifically for the Philippines as we didn’t plan on visiting! If we went with our overall trip budget of $50/person then we were $18 (per person!) under budget! Other notable costs: Scuba! We both earned our PADI Open Water certification while in the Philippines, which amounted to $353.50 per person. We treated this as an independent expense and did not include it in our daily budget calculations. However, if you were to include it, our daily per person budget would increase by $6US to $38/person. A Note On Daily Costs: In our daily costs, we have removed the cost of our flight into the country, as well as the price for our visas. We did this because we believe that including the price of getting into or out of a country results in a figure that does not accurately reflect our actual day-to-day costs. Moreover, not everyone will choose to enter the country in the same way, from the same departure point as we did, so we include the price we paid separately for your edification. We believe our Lodging, Food, Transportation, Attractions, and Miscellaneous Shopping costs are reasonable estimates that may be informative for other likeminded travelers; however, we believe the cost of our transportation into any country is best considered a separate lump sum expenditure, and we will continue to treat it as such. Similarly, visa costs vary based on one’s country of citizenship as well as the duration and validity applied for. Accommodation: Despite all the grumbling one often encounters about the price of lodging in the Philippines, for once accommodation was not our most expensive expenditure! We generally stayed at small, local guesthouses, with occasional private bungalow/island/picnic table thrown in for variety. As mentioned above, our rooms were generally very basic—sometimes bucket flush, rarely hot water, never air conditioning—so if having fancier amenities is important to you, then you will need to be prepared to pay more. It is also possible to pay less, but we found that this price point was the sweet spot for us. For more information on where we stayed during our time in Philippines, check out our Lodgings page. Food: Looking back, our food costs are a bit higher than I remembered and expected, but I think this is because we ate most of our meals at sit-down restaurants that were a step above the truly local roadside eateries. There are certainly cheaper places to eat, but we found the atmospheres in these places really unappealing as they often involved swarms of flies and severely questionable hygiene practices. There is also a small selection of fried street treats generally on offer, but the smell of the fry oil was truly nauseating for me, so we never indulged though a meal made from these items would likely be cheaper too. With all these caveats in mind, we generally only ate 2 meals per day in the Philippines, and rarely spent more than $5/person on food & drink at each meal ($5 was our cut off for a dish being “too expensive”!). Transportation: This cost covers all of our internal transport within the Philippines, from trikes around the city to flights. Obviously there was a huge degree of variability in this one as many days we had 0 transportation costs, whereas other days we spent over $100 moving around). Just goes to show the power of the average! One of our best deals for local transport was found when staying on Alona Beach—we opted to stay farther from the beach, which not only resulted in a cheaper rate, but we wound up at a guesthouse that offered free motorbikes to its guests! We were then able to use this bike to tour the entire island of Bohol, which was an amazing deal. Attractions: The Philippines are definitely an outdoors destination and activities & attractions run the gamut in terms of pricing. Many natural attractions have very minimal admission fees (a ticket to the Chocolate Hills only cost us $1.25 each). However, if you plan to engage in activities such as island hopping, diving, snorkeling, etc., then these will obviously cost more. The upside is that it is unlikely that you will do these big ticket items every single day (with all those beaches that you can enjoy for free, why would you?!? ), and additionally, the prices for all of these activities are still really quite cheap compared to other destinations. As an example, our daily activity budget here doesn’t include our initial PADI Open Water certification fee, but it does include the two other days we went diving, as well as our amazing island hopping splurge, among other things. On the whole, however, most days we paid absolutely nothing to enjoy the sights of the Philippines which definitely helped balance out those pricier days. This figure plots our daily spending per person during our time in the Philippines so you can get a better sense of how our daily average evolved. I know it’s basic math, but so often we encounter travelers who pick a daily budget and then refuse to spend a penny more than that, even though you will certainly have days when you are well under budget. We hope this helps illuminate our spending habits, and will serve as a reminder that you can have crazy splurge days (like the day we spent almost $90 per person!) and still do ok. Caveat: $32US per person per day is not the absolute cheapest you can visit the Philippines on – certainly some travelers get by on far less. But, for those travelers who want to enjoy themselves, have the occasional splurge, but still keep an eye on the purse strings, we think this is actually pretty reasonable. If you visited fewer islands, that would certainly allow you to shave off some extra dollars. It is certainly possible to spend double this if you’ve got money to burn, want to stay in fancier places, eat at nicer/more touristy restaurants or are not as budget conscious. Best memories: Marveling at how pure the colors were (“Look how green those rice paddies are! How is the water that impossible shade of blue?”) as we zipped around winding island roads; Taking our first breaths under water and finally feeling what it is to be neutrally buoyant while diving; Watching the sun set on Sugar Beach; Exploring Spanish ruins devastated by a still-active volcano on Camiguin; Sleeping on a private island in El Nido; Being visitors 8 & 9 to Banbanan; all the amazing people we met along the way. Hidden gem: It’s so tempting to award this to our secret island, but that feels too cruel! Instead, we’ll say that Camiguin and northern Mindanao don’t get a lot of traffic due to some bad press, which means you won’t encounter very many travelers while you’re there and paradise is even more unspoiled. While parts of Mindanao farther south are certainly dicey, the people we met in the north were just as friendly as everywhere else (and genuinely happy to see us!) and the landscape was truly stunning. Best Lessons Learned: The first thing we learned in the Philippines is that publication and reporting biases are alive and well in the international media. We entered the country with a vague sense of unease as warnings of bag snatchings and nebulous threats of violence danced around our subconscious. It didn’t take us long to realize that although pockets of the Philippines certainly experience real moments of strife, the country is largely a very safe, happy place to be. Of course no one is interested in reading (or remembering) headlines about all the tourists who happily travel to the Philippines without incident, or the millions of people who live there in harmony, so most people unfairly associate the Philippines with sad and scary events instead. While we believe that forewarned is forearmed and it is good to exercise caution, the Philippines taught us that truly, the world is more good than it is bad and the reports you read are often inflated. Secondly, the Philippines is the first place we experienced true poverty. We had certainly seen some down-trodden folks in parts of China, but it was nothing compared to the squalor of Cebu—where stepping outside guaranteed you would be besieged by grubby child beggars—or the extremely basic living conditions of Banbanan. Despite this, we were overwhelmed by the generosity of the locals, proving that you don’t need to have a lot in order to demonstrate fundamental human kindness. We were welcomed into so many homes and granted so many smiles, we truly felt like we had arrived in the Philippines. We hope that having now learned the true meaning of hospitality, we carry that with us wherever we go. If only! Honestly, if we could do this leg of our trip all over again, we’re pretty sure we’d do everything EXACTLY the same! Absolutely no regrets about anything we saw or did, though Bacolod for Masskara was a bit a bust, so we probably would opt to visit somewhere else instead. Still, it was a great learning experience, and we now know that huge, raucous street parties aren’t our thing! We spent 7 weeks in the Philippines, but it wasn’t nearly enough time to see and do all the things we wanted to. The more we traveled around the country, the more we kept uncovering things worth seeing. We didn’t get the chance to visit the famous underground river in Sabang while we were in Palawan as we opted to visit Port Barton instead. Also, my head cold meant that we had to skip heading farther north to Coron, which is one of the country’s top (wreck) diving destinations, so that’s something for next time. We also really wanted to spend some time exploring the island of Luzon, where Manila is located, particularly the far northern regions which feature the rice terraces of Banaue and the hanging coffins of Sagada. And speaking of Manila, we spent less than 24 hours in the city (our last day in the Philippines!) and although we certainly didn’t get to explore, we admit to liking what we saw! We’d love to go back and ramble through some of the amazing Spanish architecture that we merely glimpsed from the monorail. Sometimes you leave a place with the hope that you’ll get the chance to return one day. When it came to the Philippines, it was a struggle to even make it onto our exit flight, so strong was our pull to this magnificent place. As we ferried down the runway, bound for Taiwan(! ), it felt like we were saying goodbye to a whirlwind summer romance that we wanted to last forever. Immediately we began plotting not just what we would do on our second visit to the Philippines, but on our third and fourth ones as well. For us, our two months in the Philippines were just the prologue to a love story that we’re sure we’ll last a lifetime. We can’t wait to see what the next chapter will hold for us, but while we wait, do yourself a favor and get in there and write your own! This is an amazing article! Thanks for all of the info you guys. The Philippine’s have been added to our SE Asia list after your glowing review. I’m just bummed about the lack of vegetarian options. Looks like more white rice for me. Hello, Kim. We have a lot of vegetarian and vegan options in Metro Manila. There is a growing market for this. We have a lot of grocery stores and restaurants sprouting everywhere that cater to vegetarians and vegans. But perhaps a little pricier. Try http://www.pipinovegetarian.com/ when you visit here. Some maybe a little upscale restos have menus for vegans. Though I’m not vegetarian I’m quite conscious in choosing and purchasing our food. I buy my tofu burgers here: http://www.echostore.ph/index.php/shop-dine/echomarket/ and do my grocery shopping in Rustan’s / Landmark and Healthy Options. We have 24-hour coffee shops with really fast Wifi connections and fast food chains that also deliver to your doorstep also open for 24 hours. Kim, I am so happy to hear that you are not going to the make the same mistake we almost did, because truly, skipping the Philippines is a HUGE mistake! I can kind of understand why more people don’t visit given its press and the fact that it’s not as easy to get to and from as other Asian destinations, but it is SO worth it! The people are just so lovely and warm, I am confident you & Brian will fall as hard as we did. I’m not sure if we’re still going to the Philippines, but if we do get there we will use this post as our Lonely Planet. I don’t think I’ve ever read a post as detailed as this one. You guys summed up everything and very well, this will certainly be useful to us if (or shall I say when) we go to the Philippines. Those thatched huts look great. Isn’t it weird how people in thatched huts want to live in fancy houses and people who live in fancy houses want to vacation in a thatched hut? Whatever, though. It looks like a relaxing time. Wow. This really is everything I want to know about the Philippines. At least as much as I could think to ask you. -Were you a good haggler before traveling? -What kind of phone are you carrying? do you like it? -Did you need to show proof of onward travel when you got your visa? -What dates were you there? Trying to gather info on low/shoulder seasons. Definitely going to bookmark this for a later date. Thanks for all this info! 1) We pretty much never haggled prior to leaving on our trip and still kind of hate it, though we have gotten better. Pretty much you have to get over the whole “it’s distasteful to discuss money” taboo that permeates Western society and go for it. People will not be offended if you try to move the price around, and we always remind ourselves that the worst thing they can say is no. You have nothing to lose by trying to haggle and we’ve found that more often than not, “ask & ye shall receive” seems to be the name of the game here. We still don’t instinctively haggle, but by remembering that you’re just trying to get a fair price and that if you really are asking for too much for too little that no one will accept your offer, then you will do ok. We are never out to screw the people we are dealing with, and we don’t nitpick over every last cent. For us, haggling is a necessary evil, not a blood sport! 2) We wrote about the phone we are using in this post: http://www.20yearshence.com/the-best-world-communication-device-ever/ We have been REALLY happy with this phone, largely because we can download free maps for most countries and use the GPS without having any kind of data plan (which you can’t do with, say, an iphone). In 10 months, Cambodia is the only country we have visited where Nokia didn’t have maps, otherwise, we’ve had great coverage everywhere! 3) Normally flying into the Philippines you will need to show proof of onward travel, but for whatever reason, we managed to dodge this on our flight in from China as the girl only asked us if we were flying out of Manila (which we were… but to somewhere else in the Philippines) and didn’t ask to see the ticket. When you are in the Philippines trying to get a visa extension they don’t ask to see anything. I don’t know if they would ask for proof of onward travel if you’re applying in advance, but chances are that if the visa office doesn’t, the airline you’re flying still will. 4) We were in the Philippines from Oct 9 until November 27. I think different parts of the country experience high & low season at different times because of the pattern of the monsoons. Awesome wrap up post! I’ve been through all your Philippine posts this week as I’m trying to convince my husband that we should stopover in the Philippines en route to North America later in the year. I really want to go to El Nido but not sure we could manage the bus ride with a toddler!!! Bethaney – Flashpacker Family recently posted..Is Travelling with Young Children Worth It? I’m so glad you found all of our posts helpful! If you have any other questions, feel free to drop us a line! I think it would be possible to get to El Nido with your toddler—the vans do stop for breaks and weren’t overly crowded like other ones we’ve ridden in SEA. They were actually pretty comfortable (better than a bus). If your budget could stretch, you could probably also hire a private car for not too much, though certainly more than taking a shared van. Philippines is severely understood and has huge misconceptions in the international scenes. I am canadian and one of the people lucky to have travelled in the country for many times. The country consists of 7,107 beautiful islands you can ever find in this planet. 5 maybe 6 of those islands in the deep south do have history of violence and terrorism due to a pocket of extremists living in those islands. But those islands are very much secluded and far away from the main stream and what the country truly is about. Yes, there are crimes that happens everywhere, but what country doesn’t ? Philippines by in large is just as safe and normal to be at as it is in any other advanced first world countries. There are spots of poverties in the country, but you will be amaze how generous and happy these people living in that condition. Some of the warmest and friendliest there are in this world. You just feel it in your bones, and therefore it is contagious . The level of contentment and the smiling faces everywhere are just some of the best things that will encourage you to go back over and over again. Philippines is a very special place not only for its beautify, but mainly of their people.Sad and unfortunate the country are not getting a great reflection in the international media, but you’ll be surprised what it has to offer. Personally, i feel Philippines is the best in asia in terms of hospitality and the people. And perhaps the sceneries are even better! So many and endless beautiful places and islands to explore. If only the government can really fight off the corruption and get their act together on their infrastructures and improve tremendously, i have no doubt that this country will kick some major butts in the region and perhaps in the world in terms of tourism and one of best destinations in the world! They have historic landmarks, big bustling cities w/ some of the biggest shopping malls in the world! They have some of the best and heavenly beaches / islands in the world! Such a great picturesque landscapes and truly breathtaking and majestic landscapes by land or by sea. Great literacy and very rich natural beauty and resources. On top of their friendliest and most hospitable people! Shame that poor governance by the leaders are the reasons it wouldn’t progress as it should have! Philippines is so underrated in so many ways. Iss, we completely agree with you! We went into the Philippines with open minds and were blown away by how wonderful it was, particularly by how safe we felt and how lovely the people were. It’s a shame more people don’t have the interest in visiting as it is definitely underappreciated and one of our favorite countries. Rika | Cubicle Throwdown recently posted..Could you live off a dive instructor’s wage on Roatan? Air Phil Express is the budget arm of PAL. Their prices are cheap but I found that traveling on Cebu Pacific was much cheaper. Air Phil does gives you 10kg allowance but if you exceed that they ream you on extra baggage. On Cebu Pacific you can get 15kg of allowance when you book for a few dollars. Likewise you can add on a bicycle as sports equipment, there wasn’t an option for that on Air Phil Express. You mentioned that you used Digi for 3G, Digi is Malaysia. 🙂 I think you meant Smart? I found that internet speeds were sufficient outside of Manila using 3G. I bought a Tattoo modem from Globe and unlocked it on the web so I could use both Smart and Globe. I did the day to day internet with it and sometimes in the middle of nowhere I would get the fastest speeds, in fact I got 3 mbps downloads in the jungles of Mindanao but in Manila I could barely pull up a page. Jack recently posted..Why Are We Playing Games Instead of Solving Problems? Thanks for your feedback, Jack. You’re right that we did mean Smart & we’ve updated the post to reflect that; we had Digi on our brain from Malaysia and we now have a wallet full of SIM cards that it’s hard to keep track of. Seems like there is a Smart in every country (like Cambodia, where we currently are, for instance)! When we go back to the Philippines we might try out your modem solution, though I admit, it wasn’t such a hardship for us to go unplugged (though the blog did fall woefully behind); can be a nice refresher! Really comprehensive guide Steph, I’m hoping your campaign on the joys of the Philippines will win people over to its wonderful charms. I love this article! It makes me proud to be a Filipino! A lot of people consider the Philippines as a great place to retire too. Maybe on your next visit you cn drop by the Sand Dunes of Ilocos Norte, surf in La Union, visit the Hundred Islands in Pangasinan, visit the African Safari or go snorkeling in Coron, Palawan, go clubbing in Bonifacio Global City or Resort’s World (Manila), swim with the whale sharks in Sorsogon and more… I’m really glad you’ve enjoyed your stay. Lol. Sharing a link of a recently discovered beach with pine trees that’s just about 3 hours away from Manila: http://thisisslightlyepicurean.blogspot.com/2013/03/a-beachy-weekend-at-nagsasa-cove.html, the stars at night are amazing. Oh and you might want to try this hostel when you’re in Manila. http://www.hostelworld.com/hosteldetails.php/Our-Awesome-Hostel/Manila/69817. I hope to see you guys around! =) Happy Traveling! I’ve been reading about your trip in my country, Philippines, especially in my hometown Sipalay (I grew-up in the nearby Sipalay Mines) and Bacolod City. I’ve been watching over your posts since you arrived via Cebu en route Bohol and it felt great and proud that your experience in my country had brought something in your life – from getting back yourself in Bohol, to getting braver and fulfilling your dream to dive, with how Apocalypse’ family provided you a humble dining and sleeping at the open with only a mosquito net over inspite the prevalent poverty. I’d admire your genuine heart and open-mind to trust the kindness of the people. I’m not too sure if I can do that. Both yours and Tony’s posts gave me a different perspective why I travel – it’s not all about sharing itineraries and tips on DIY travels but more of the experiences that I can get from traveling. How we connect with people, knowing them, talking to them, understanding the culture and more. It’s more of appreciating what really life is all about. Thank you for your lovely comment, Claire. Tony & I are both so happy to hear that you have been enjoying our adventure and appreciated the insights we have gained during our time traveling through your country, and that we have helped you view travel in a different light. For us, it’s all about connecting with the world around us, and that means meeting and interacting with people wherever we go. Sometimes we get taken advantage of, but more often than not, we have found that people are overwhelmingly good. Really useful info for when we get to the Philippines in July – thanks Guys. I guess I’m going to be living on rice and fruit then (I knew I shouldn’t have gotten used to the vegetarian food in Indonesia!). We’ll definitely check out domestic flights to get around; we’ve found this to be cheaper and quicker than buses and boats in Indonesia too. With only 30 days in the Philippines though I think we’re going to have to carefully choose where we visit as it sounds like there’s so much to see. What place should we absolutely not miss? On your advice we intended to get a longer Philippine visa in advance in Jakarta to save money – annoyingly this never happened. When we arrived at the visa office they were shut because of an election, when we tried again in Surabaya the office simply didn’t exist where it was supposed to! I would say the two places you’re likely to have the most fun with from the places we went would be Palawan (definitely El Nido) and the island of Bohol. I definitely think a motorbike is the best way to see Bohol, but if you & Andrew aren’t comfortable on one, then you can do a private car/trike to take you around the island which would definitely be better than doing a jeepney. If you want to learn to dive, I can send you the information for our secret island, which is not on either island, but well worth a visit! Also, just remember that the Philippines only offers a 21-day visa on arrival, so if you are planning to spend 1 month, you will have to get your visa extended in country. Thanks for the recommendations Steph. As we couldn’t get a visa in advance in Indonesia and we have to be in Thailand to meet friends and family in August anyway, we’ve decided to just stay in the Philippines for 21 days this time around. Hopefully that will be enough time to see Bohol and Palawan – not sure we’ll get around to the diving though, sadly. Interesting and thoughtful write-up. Very cool. Amazing cost analysis of your trip to the Philippines! I have been going back and forth PH in the past 10 years, on account of work. I get to do in small bites some of the things you did whenever I’m there. Next time, I highly recommend up north Batanes (an Englishman tells me it looks like Cornwall), it’s almost a different country but the logistics is pricey and complicated. It is just as the photos show. In the north, the Cordilleras (you need strong legs to go up and down those terraces) but hell of a lot of fun, the old colonial town of Vigan and a few Spanish church relics. In Manila, you probably saw Intramuros from the train. It is not really Asian – deep in the heart, it is “Pacific”, with Asian, European, American touches. Since you’re into languages, you might check out the Austronesian languages, the most widely dispersed language group in the world with as many as 300 m speakers stretching from Madagascar to Easter Island, native Taiwanese to Maori. The root of the Malay Polynesian languages (the major branch of Austronesian) began in northern Philippines, Batanes most likely. Lots of good tips for my next visit. Batanes is definitely on our list of places to hit in the Philippines some day; we read about it in an in-flight magazine and thought it looked stunning, if rather difficult to reach! Isn’t that the case for all things in the Philippines? 😉 And we definitely want to visit northern Luzon! We were initially planning to do that on this trip, but obviously things didn’t work out and we managed to keep ourselves busy anyway, but next time, we’ll definitely make it a priority. Thank you Steph for this post, i passed my Scuba diver Padi and was looking for some exotic spots to go for the Open Water. Its is rather the same price than in Europe but i am sure you can see so much more than in Barcelona (where i am based). Hi Gregory—we do still have the info on the place we learned to dive, but prefer not to share it on the blog so that it doesn’t get overrun with visitors. 😉 Email us if you’re still interested and we’ll pass it along! Perhaps it depends on what time of year you were in the Philippines and also what islands you visited? By the looks of it, it sounds like you were paying nearly $40US per night for rooms, which is nearly double what we spent. We really didn’t find it difficult to find lodging in our pricerange, but then again, we sometimes stayed at places that weren’t the nicest. Every traveler has different standards, but I think that if you get off the beaten track, it’s eminently possible to find nice (if basic) lodging for half that price. Great read! I too lurve the Philippines. The only thing that frustrated the hell out of me each time I was there was the lack of good, reliable and FREE wifi available. Even in Manila I struggled many times to find a cafe where I could sit and do some work using the Wifi. Starbucks, for example, actually charges you to use their Wifi. And Starbucks are probably the most popular cafe in the Philippines. There seems to be one literally around every corner in Manila! The only cafe chain that I found to be good was the Coffee Bean. But you have to have a special card to get free internet access. Luckily my Filipino girlfriend had one – I am not sure how much they cost. But you’re right: it’s not an easy place for the digital nomad to travel through. Still a beautiful place and WELL worth visiting! Yes, I think a large reason why our blog fell so far behind so early on is because we spent 2 months in the Philippines and struggled to get online for probably 5-6 weeks of that time! Many places we visited didn’t have electricity for most of the day, never mind wifi, but honestly, it was a small price to pay considering how amazing everything else was! So glad to hear your enjoyed the Philippines, too! It’s definitely at the top of our list in terms of countries we’re anxious to return to. Hhahaha yes Steph, well, perhaps the break was well worth it. I’m keen to return. Just have India ahead of me which I’m looking forward too. But I know I will be back one day too! Oh, we know we’ll be back one day too! The Philippines are just way too great to only visit once in a lifetime! I do agree with you when you said that The Philippines is not Asia. I always tell my friends that when they are tired of Asia, they should check out The Philippines. Asia is a really diverse place and many regions have very different vibes. For instance, I could see being burned out on Thailand or Malaysia but then finding Taiwan or Japan or Korea a delightful change of pace (or vice versa). Nepal is part of Asia, but it feels completely different from the places we visited in SEA. Heck, even in Indonesia different islands seem like different countries! So, I think that if someone claims to be sick of Asia, they just need to mix things up! I definitely think that there is nowhere else in Asia quite like the Philippines… definitely has more of a Caribbean vibe! Wow, this is quite the round up. We have been considering the Philippines for quite some time as it is the only major Southeast Asian country we have not been to, but you give us a lot to think about – lack of wifi, buses that remind me Guatemalan chicken buses, and less than stellar food. We will go eventually, though, and I will turn back to this article when we do. The Philippines is still one of our favorite countries, so we’re always happy to hear when fellow travelers are considering visiting for the first time. Even with the few downsides that traveling there involves, there’s so much to love about the country that I personally have no trouble overlooking the few things that aren’t its strong suit. When you’re in such a beautiful country filled with such beautiful people, having slower internet or mediocre meals just doesn’t seem all that important! Hi Sam! Thanks so much for taking the time to comment and let us know that you found our post useful. We haven’t been to the Maldives so can’t compare it directly to the Philippines, but nevertheless, the Philippines is one of our favorite destinations of all-time, so we’re pretty certain you’ll have a wonderful time there! Please let us know how it goes! If you ever come back, and I hope that you do, there are way better food options that you can have. bus terminal food is sadly really usually crappy, but there are way better food than what you’ve described here. I feel that your trip was shortchanged because of your less than stellar food experience. you should do a fiesta hop (visit places during their fiestas, usually a catholic celebration merged with the town’s government celebrations) you’d be way surprised!!! Hi Sherlyn—thank you for taking the time to comment and for sharing your thoughts. I completely agree that we got the short-end of the stick when it came to local food in the Philippines and I’ve no doubt there must be better options than the things we tried. Whenever we’ve enjoyed Filipino home cooking with friends, it’s always been really delicious. But I do want to point out that even though we were letdown by the food we experienced in the Philippines, it really didn’t detract much from our overall impressions of the country—we really loved it there and would willingly sacrifice good food for more time there (though hopefully it won’t come to that and we can do better on that front next time!). Amazing article really! I was thinking about the possibility of traveling to the Philippines, but after this I am definitely going. I’m curious though, I’ve been looking at the best times to travel there and and many post say that October and November (the exact months I was planning on going) are the worst time to go. But that seems to be the period when you visited. I would love your opinion (sorry if you already wrote something about this). Hi Sheryne—it really is difficult to find out information on when is the best time to visit the Philippines, isn’t it? I think this is because the country is so large and so different parts experience high season when others are in the midst of low… from my reading, I think that October & November are actually great months to visit, with the summer months being the worst as their in the midst of the monsoon/typhoon season. We were there from early Oct to early Dec and had no real problems whatsoever—a little rain, but the closer you get to Xmas, the better the weather should get (though the closer you get to peak season as well!). Thanks for stopping by and taking the time to comment, Carina. I’m so glad to hear that you enjoyed this post! Hi Steph – I’ve been following your blog for a while now and have found all of your country summaries soooooooo helpful! The Philippines is one country that my soon-to-be hubby and I are thinking about heading to during our upcoming RTW trip (leaving soonish!). The more I hear about it, the more I want to go! Do you think 3-4 weeks would be long enough for us to do this country any justice? So glad to hear you’ve found these summaries helpful, Nicole. They take a lot of time and we try our best to make them as helpful as possible, so your positive feedback is much appreciated. As to your question, I tend to believe that you can’t really budget too much time to the Philippines—we spent 2 months there and left with a longer list of things to see and visit the next time we go back than we came in with!—but certainly 3 or 4 weeks is better than not going at all and you can certainly do a respectable amount with that time. My main advice would be to try not to cram in too much, especially because getting around is not exactly easy or fast in the Philippines. I wouldn’t visit more than one island per week and if you can look into budget flights and book those in advance, they will probably help you save a fair amount of money. We generally suggest prebooking as little as possible, but flying makes your life MUCH easier in the Philippines, but in order to get the best deals, you’ll want to book a bit in advance. If you hang around the Visayas, you can probably rely on ferries, but if you plan to hop from say, Bohol to Palawan to Luzon to Mindanao as we did, you will need to fly. Our guiding principle as we’d rather do less and really enjoy ourselves so that we want to return than try to cram in a ton of things and have a lackluster experience as a result. Remember, no matter where you choose to go or what you do, there aren’t really any bad choices in the Philippines. I’m sure you and your hubby-to-be will have a blast! Very well written article and useful information for fellow travelers. To truly experience this country, culture and attractions takes time because of geography. Take note of other magnificent sites that this country has to offer. Unknown to many Samar island is a hidden gem for spelunkers for its many undiscovered underground cave system and its many jungle waterfalls that is out of this world. The island of Siargao for its “Cloud 9” surf, Oslob, Cebu for its whale sharks, Malapascua island for its thresher sharks, Moalboal and Pescador island for its magnificent diving opportunities, the Tubbataha Reef in Palawan, Calaguas island in Camarinez Norte (it ‘s like Boracay island 30 years ago) just to name a few. Thanks for taking the time to comment, Gage! There is so much to explore and enjoy in the Philippines, we know we only scratched the surface during our all-too-brief visit. Can’t wait to get back to experience more of the delights the country offers, both above and below the waves! Thanks for the many suggestions you’ve offered—some are places we already had on our list of places to visit, but some are new to us and we’ll certainly follow up on them! Hey, 11 days in the Philippines is certainly better than 0 days! 🙂 I hope you have a wonderful time and I’m glad to hear you’ve found these posts helpful. My name is Rory and I am currently trying to plan a 3-4 week trip to the Phillipines in April as a celebration of graduating medical school. I am a little overwhelmed by all the online options out there for travel planning, and am trying to figure out where exactly to start. This post is extremely helpful, thank you for taking the time to be so detailed and share such useful information. I was wondering if you wouldn’t mind giving a few tips or chatting about how to start devising a schedule and transportation. Any help would be appreciated- thank you! Hi Rory. Thanks for your comment and we’re glad to hear that you have found our site so useful and are very jealous of your upcoming trip to the Philippines. Unfortunately we are in the midst of our own travel preparation and don’t have the time at the moment to provide personalized travel advice to other travelers at the moment regarding travel itineraries. Our best advice is to simply look through guidebooks and travel blogs and flag a few places that you are most excited to visit… and then visit them! For a 3-4 week trip in the Philippines, I wouldn’t visit more than 2 major islands during that time as it often takes a while to get anywhere; better to go to a few places and really enjoy them than spread yourself too thin. Whichever destinations most appealed to you from our site, check out where they are on a map and maybe pick 2 or 3 places that are close together and stick with that. You can always go back if you have a good time, but you don’t want to spend all of your time moving from place to place rather than enjoying those places! The Philippines is a wonderful country (still one of our favorites), so no matter where you choose, you’ll certainly have a great time! i truly enjoyed reading your adventure in the philippines. i’m a filipino from cebu city and is currently residing in southern california. your blog is very smooth reading (no misspellings, correct grammar, and just plain easy to read) and i understood why at the very end–you’re dr. steph (highly educated, avid reader). Great post! I loved my month in the Philippines but a few of these elements were present in my trip as well. I had never craved green vegetables until my trip to the Philippines. Even in Boracay, where I splurged a bit (after spending a week in a jungle in Borneo) and really liked the international mix of food, vegetables never made the priority list. I completely agree on not booking lodging in the Philippines ahead of time. I’ve very uncomfortable with this concept, but it turned out to be exactly the right way to play it. Negotiating is expected. On the airlines, I can certainly add that what you referenced with cancelations was consistent with our experience. Our (half-empty) flight was canceled at the last minute due to “rain” on a sunny day where we couldn’t even locate a cloud. I’m jealous that you made it to Palawan – I’ve heard such good things about the diving. I thought the diving near Bohol and Boracay was unimpressive, but heard El Nido is where you need to get to. So glad you had a great time in Philippines, Todd, and that you feel this post is still accurate and useful. Whenever you return, definitely make Palawan a priority—it was definitely one of our highlights! We were unimpressed by the snorkeling off of Bohol (we weren’t divers yet when we visited there), and I’d say El Nido’s diving was better than that, though it’s certainly not the best we’ve ever experienced. For that, I’d say Borneo & Indonesia are better bets! Philippines is a beautiful country to visit. The people speaks English and the cost of living there is cheaper. I also love the fact that they have sweet mangoes and bananas during their summer season. Yup, the Philippines is a pretty great place to spend time. We really appreciated how easy it was to communicate, and it was nice not having to pinch our pennies too! It’s not that most islands lack ATMS, it’s simply that on certain islands there may only be one or two ATMS (or, occasionally none… for instance, when we spent a week on Camiguin, we made sure we had enough money to cover us for the week!). Unless you are flying somewhere quite remote initially, I can’t see any reason to get all your pesos in advance of arriving in the Philippines. If you can use the ATM at the airport in Cebu, then that should be fine. Depending on where you are going, you should be able to get money along the way, but try to research the specific destinations you plan to visit—Wikitravel and Lonely Planet can be very useful for this as they often tell you about banks and ATMs. I cried towards the end of your journey in the Philippines. So heartwarming and surreal even if I was just reading it. Hopefully I’ll get to visit there soon! Oh, Chris. Thank you so much for your lovely comment & for taking the time to share it with us. It means so much to us to know that our travel stories have had this kind of effect on you, so thank you for letting us know. I hope you make it to the Philippines soon; I’m sure you’ll love it! I am from the Philippines and just came across your blog researching for our upcoming family trip to Europe. When i saw your picture i thought you maybe a Filipina so i searched your post about Philippines . I was really surprised and moved of how you find our country so endearing. Same with the last person who commented, i was really crying reading your blog especially the last part. Made me realize, i have been touring around the world but i have yet to see our own beautiful islands…. and i will start planning now! Deeply appreciate how you learn to love our country and people! Please be back soon! This is the most detailed and colorful guide about my beloved country the Philippines. You covered literally everything there is when travelling in the country. Best post ever! I’m so jealous of your travels around the country. You enjoyed all the best the Philippines can offer. I hope that I could explore my country as much as you did.